So in those instances where Scripture speaks of God’s purpose, plan, counsel, pleasure, or will, these passages are referring to the divine decree by which God, before the creation of time, determined to bring about all things that were to happen in time. John Piper, summarizing God’s decree, says, “He has designed from all eternity, and is infallibly forming, with every event, a magnificent mosaic of redemptive history” (Desiring God, 40). This helpful summary presents three characteristics of God’s decree that succinctly encapsulate the teaching of Scripture: God’s decree is eternal, immutable, and exhaustive. First, Scripture presents God’s decree as having been determined before the creation of time, and thus it is said to be eternal. · David praises God because all his days were ordained and written in God’s book before any one of them came to pass (Ps 139:16). · God’s election of individuals to salvation is said to have occurred “before the foundation of the world” (Eph 1:4; cf. Matt 25:34; 1 Tim 1:9). · Paul also says that the plan of salvation of the Gentiles was in accordance with God’s eternal purpose (Eph 3:11), which mystery was “predestined before the ages” (1 Cor 2:7). · In Isaiah 46:10, Yahweh asserts that He will accomplish all His good pleasure and establish all things according to His purpose. What these passages are teaching us is that all of God’s providential actions in time conform to a fixed purpose which precedes time. And this “fixed purpose” is none other than God’s eternal decree. A very important implication of the eternality of God’s decree is that it is entirely unconditional. That is to say, nothing external to God moved Him to decide to do one thing as opposed to another thing. Edwards said, “His will is supreme, underived, and independent on anything without himself; being in everything determined by His own counsel, having no other rule but his own wisdom.” In fact, not only is that not the case: it’s impossible. Because God, who is the only self-existent, eternal Being, was the only entity present in eternity past (Col 1:17). To put it simply, God’s decree wasn’t influenced by anything external to Him because there was nothing external to Him (Gen 1:1; John 1:1–3). The consequence of this reality is that every one of God’s decisions that make up His decree—down to the minutest of events and actions—was an entirely free decision according to His own will. This is why Scripture so often refers to God’s decree as His “good pleasure,” or that which pleases Him (Ps 115:3; 135:6; Isa 46:10; 48:14; Phil 2:13). So far from teaching that any part of God’s decree was based on an external influence, Scripture proclaims: “All the inhabitants of the earth are accounted as nothing, but He does according to His will in the host of heaven” (Dan 4:35). To such an objection (one that is unfortunately all too common), Scripture replies that God’s decree is not only eternal and thus unconditional, but also unchangeable. · Rather than the possibility of a creature altering God’s decree, the psalmist declares that it is God who nullifies the creature’s counsel, even frustrating the plans of peoples (Ps 33:10). · The next verse cements that reality: “The counsel of Yahweh stands forever, the plans of His heart from generation to generation” (Ps 33:11). · In a similar fashion, God Himself tauntingly asks, “For Yahweh of hosts has planned, and who can frustrate it? And as for His stretched-out hand, who can turn it back?” (Isa 14:27). · And after receiving what is perhaps the most scathing, forceful rebuke in all of Scripture, Job simply summarizes the immutability of God’s decree when he says, “I know that You can do all things, and that no purpose of Yours can be thwarted” (Job 42:2). Finally, God’s eternal and immutable decree is also exhaustive. God is said to work all things after the counsel of His will (Eph 1:11). The psalmist repeats that the Lord does whatever He pleases (Ps 115:3; 135:6). He Himself declares that He will accomplish all His good pleasure (Isa 46:10). However, such exhaustiveness is not merely a general control; rather, God’s control over creation is specific and meticulous. In his Systematic Theology, Wayne Grudem provides a helpful survey (318–21). · God is the cause of the various kinds of weather (Ps 148:8; Job 37:6–13). · He causes the grass to grow (Ps 104:14) and the sun—which Jesus calls His sun—to shine (Matt 5:45). · He feeds the animals of the earth (Ps 104:27). · It is His will that determines the deaths of even the smallest of birds (Matt 10:29). · And not only does He remove and establish kings (Dan 2:21), but He even turns their hearts wherever He wishes (Prov 21:1). · Even those events which seem random are determined by God (Prov 16:33). · Neither do the events of our personal lives escape God’s sovereign foreordaining, for He supplies our every need (Phil 4:19; Jas 1:17), determines the length of our lives (Ps 139:16; Job 14:5), and even directs our individual steps (Prov 16:9; Jer 10:23). · His control extends through the entirety of salvation (Rom 9:16; Eph 2:8–9; Phil 2:12–13), to suffering (Gen 45:5–8; 50:20; Job 1:21; 2:10; 12:9), and even evil (Isa 45:7; Lam 3:37–38; 1 Sam 2:25; 2 Sam 24:1; Acts 2:22–23). In light of the Scriptural teaching concerning God’s decree—(a) that it is eternal, and thus uninfluenced by anything external to God, (b) that it is unchangeable and cannot be frustrated, and (c) that it includes absolutely everything that occurs in time and space and beyond—the only reasonable conclusion for the student of Scripture to come to is that God may be properly said to be the ultimate cause of all things. As John Frame says, reflecting on the Biblical evidence, “Through the centuries of redemptive history, everything has come from God. He has planned and done it all. He has not merely set boundaries for creaturely action, but has actually made everything happen” (Doctrine of God, 58). The exhaustiveness and meticulousness of God’s sovereign decree raises a significant question: How can God be the cause of actions and events that are evil and sinful—things which God Himself prescribes against—and yet not be rightly charged with unrighteousness? That’s a question that needs to be answered, and we’ll take a look at it in a future post. But for now, let us at least acknowledge that, based on the biblical doctrine of God’s decree summarized above, Scripture gives us no other option but that God is indeed the Sovereign Lord who works all things after the counsel of His will (Eph 1:11). Mike Riccardi is the Pastor of Local Outreach Ministries at Grace Community Church in Los Angeles. He also teaches Evangelism at The Master’s Seminary. This entry was posted in God, The Attributes of God. Bookmark the permalink. For those who might think this is about Calvinism, it’s not. 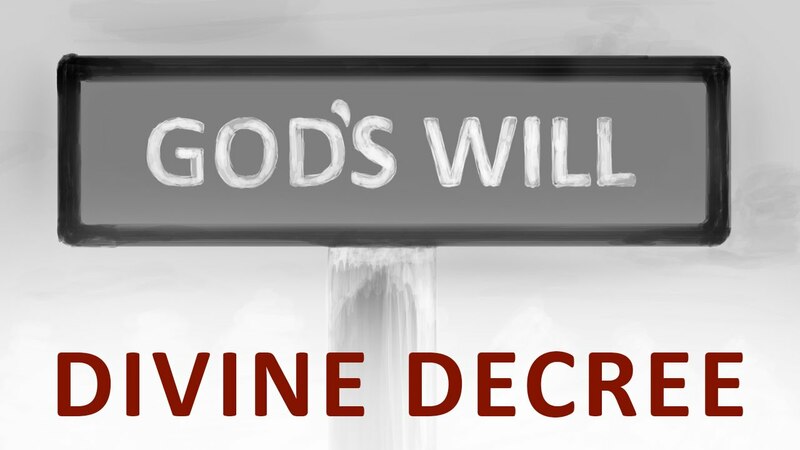 It’s simply a post describing, with scriptural support, the decrees of God as they relates to His will. If you would like to comment concerning the decrees and will of God, feel free. If you want to argue against Calvinism, please don’t bother.